April is having a difficult time with her life since running into May East – O’Neil is questioning everything that she’s doing and why she’s doing it. April finally decides that she’ll have to deal with her (ancient) past, and seek out May East. Master Splinter pulls out a book entitled “Legends and Mysteries of the Orient” and explains that he’s been researching May East’s era. The Sensei tells April that all he’s been able to discover thus far is that East comes from a time when dark forces and magic were much more prominent than they are now. Leonardo suggests that they go see Bookwurm, as he may have some more tomes about the subject at hand. As the guys prepare to head out, a giant bubble arises from the sewer water, carrying none other than May East. 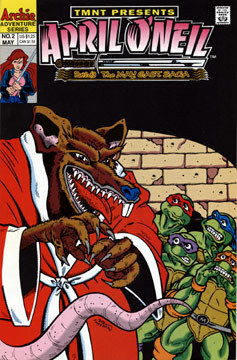 East easily defeats the Turtles in battle and April prepares to attack – but East states that she has no desire to fight her own blood and uses a magic crystal to shrink herself and enter Splinter’s brain – who she promptly possesses.